The Problem of Evil is the apparent contradiction between the idea that God is infinitely loving, and the fact that he created us in a world with such intense suffering. It’s a serious problem for Christianity — and it’s probably one of the main reasons people end up rejecting the notion of God altogether. Even if they never consider the question philosophically, most people have dealt with the problem emotionally. They know, at a deep level, that there is something wrong here. Many people have attempted to offer answers. I’ve even taken a stab at it. But most of those answers are off-putting at best, and do little to advance the notion that an all-benevolent God is actually a realistic thing to believe in. And yet, here we are in this world. And year after year, we as humanity keep bringing new children into it. We do so, despite knowing that they will suffer. We do so, despite knowing that their life will consist of pain — most of which we will be powerless to prevent. Year after year, our ancestors decided that life was worth having. Generation after generation weighed the suffering and evil and goodness and joy of this world, and decided that bringing new life into it was a benevolent thing. Many of them even believed that bringing children into the world was their greatest act of love. So there is a deep irony at the heart of the Problem of Evil. To pose it as a challenge to God is also to pose it as a challenge to ourselves. To the extent that the Problem of Evil destroys our notion of God, it destroys our notion of humanity. If God isn’t benevolent, then neither are we. But if we cast in our lot with the human race, then we act in trust in the benevolence of bringing new life into the world. And so we implicitly trust in and justify God’s actions in creation. Perhaps this is the reason that most of humanity does believe in God. We’ve struggled with the same questions that God must struggle with, and we’ve chosen to trust in the future of humanity, in the ongoing adventure of human life. 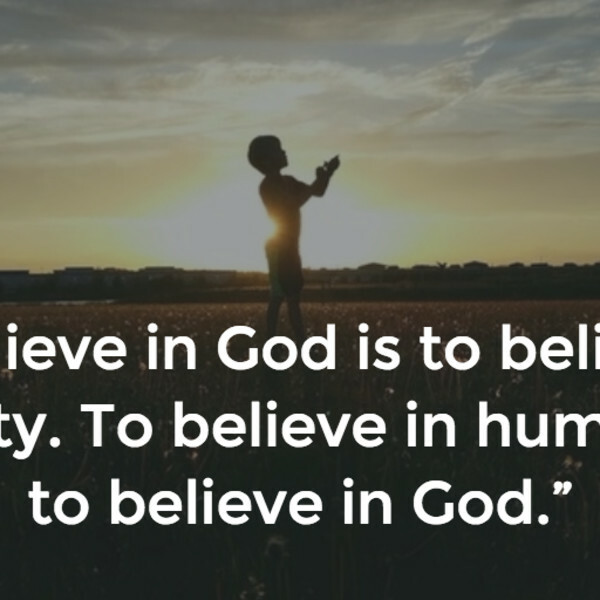 Deep down, we know that to believe in God is to believe in humanity, and to believe in humanity is to believe in God. Read a more technical defense of this idea. Thanks to Lincoln Cannon and Becca Kello for inspiration. I didn't have time to go back & review the other posts in this series, but somehow this new one reminds me of a previous one quite like it, particularly the point regarding humanity still being willing to bring new children into existance despite their knowledge of what may be in store for them. Saying that, my answer will probably sound familiar too. It all has to do with 1. creation being a living, evolving system containing many things that occur randomly or as the inherent nature of this creation ( like the effects of gravity, lightening, geology, etc. # 2. Humanity enjoying the gift/ curse of having Free Will , one of the signs of our being made "in the image of God ". # 1 is the cause of many things people often label as "evil" , like earthquakes, floods, disease, birth defects etc., but are actually merely the "side effects" of our existance in a "living" creation in a constant state of flux. God will not normally "spare us" from such things since they are necessary for our creation to exist, as well as a part of reason #2, Free Will, because as a result of Free Will and our intelligence God gives us the ability to avoid or overcome much of Nature's deadly qualities. ( Ie. Don't try to walk in molten lava, don't stand outside in a lightening storm, do find a cure for diseases, etc ) But its Free Will, coupled with our ability to know Good from Evil , that is the basis for the vast majority of "Evil 'that occurs in this world. God doesn't " cause evil " but He allows evil to be done by mankind, its the result of our having the gift of Free Will, without which we would be either "dolls " God plays with in an unchanging "doll house" rather than this creation or we would be mere animals ruled by hormones and psychological 'instincts ", not men . Whether or not one believes in Evil as a living being ( aka Satan ) who "tempts men " into evil acts contrary to God's Will or contrary to the well being of others--take your choice , there is no denying that it is mankind that physically commits the evil acts that afflict the innocent . So evil at the level of action / reaction is the result of man choosing to do what will harm another human, using his Free Will to make that choice. How we choose to resist / overcome the desire to "do evil" is another topic, but it seems pretty obvious that evil actions are the result of men choosing to commit for evil for their own selfish ends. ( Not going to go into the subject of those incapable of truly "choosing" due to mental illness, retardation or other organic things beyond one's control ) Want to know the source of the "Problem of Evil " ? Just look at another human being, or in the mirror. Thanks for that Micah. I enjoyed it. Your premise also implies that God experiences limitations that are analogous to ours.